Frozen Factory (フローズンファクトリー Furōzunfakutorī) is the fourth world of Sonic Lost World, set in a winter wonderland with industrial refineries and even a casino area. In the 3DS version, the player can gather White Material here. 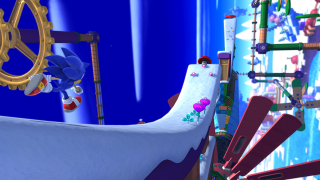 Like previous areas, this Zone has the player traverse tubular planetoids, with lots of rotating machinery, as well as ice that Sonic can skate on and do pirouettes from. This Zone also has tubes for Sonic to travel in, much like those seen in Chemical Plant Zone. Set at night with a beautiful aurora in the sky, this Zone has a very unique gimmick in which Sonic automatically does a Spin Dash, encasing himself within a giant snowball that the player must navigate through the whole stage. The stage is very treacherous, with Cluckoids and large yetis that can push Sonic off into the abyss. As the snowball rolls, Rings stick to the snowball, but they will not be collected until a checkpoint is reached. Appearing twice during the stage are billiard tables that will reward the player with Red Star Rings if they are able to pocket all the balls. Eventually, the player fights Zeena while in snowball form. Zone 3 is a stage with casino theme, reminiscent of the likes of Casino Night Zone and Casino Park. Crawls, Egg Pawns and Nebulas reappear at this stage. There are several tricks throughout the whole stage, which can unexpectedly kill the player or help them, including neon lasers that can fry Sonic, falling purple dice and giant slot machine reels that roll about and crush him. There are also plenty of tokens littered about that the player can collect, which are then converted into bonus points upon reaching the end of a section, and by bringing enough can the player enter a pinball table. In the pinball tables, the player can collect extra points from bumpers, hexagons, triangles and other objects by using Flippers on the bottom part of pinball table can normally player launch to higher parts. After collecting 1,500 points in the pinball table, the small hatch in the middle of table opens and the player can move on to the next part at the Zone. Zone 4 has a mixture of 2D and 3D sections filled with ice to skate on, and an industrial area remniscent of Metropolis Zone, complete with bolts to run on. Zeena awaits the player at the end of the Zone. 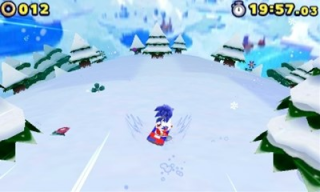 Unlike in the Wii U/PC version, Zone 1 in the 3DS version opens with a section where Sonic rides a snowboard, very similarly to IceCap Zone and Ice Cap. While riding the snowboard, the player can launch off ramps by pressing at the right moment, then perform tricks in the air by pressing . After the snowboarding section, the player will traverse an icy terrain where the 3DS-exclusive Ivory Lightning Color Power can be used to destroy Badniks and latch on to electrical poles. Eventually, the player will go through puzzles where they must push snowballs through mazes full of rolling gears and push them on switches to advance. Unlike the first Zone, Zone 2 is completely in 2.5D. There are plenty of icy platforms to traverse, rails to grind, and ice blowers that will freeze Sonic solid. Unlike the Wii U/PC version, Sonic will not skate or do pirouettes on the ice, but ice physics still apply. Zone 3 is very similar to Zone 1, and can potentially be one of the longest levels in the game if you don't know what you're doing. This Zone is broken into multiple sections where you must push snowballs around and put them into holes to open capsules containing items and springs to advance the player through the level. A snowball will not fit into a hole unless it has reached a big-enough size by rolling it around on the snow and ice. After the first area, a snowman head will appear and start stalking Sonic throughout the level, freezing him upon contact, and will destroy any snowball it bumps into. The only thing Sonic can do to it is stun it by hitting it with a Homing Attack. Frozen Factory was also featured as a special event stage in Sonic Runners, though unlike Desert Ruins and Tropical Coast, it was not part of the game's story and was instead played in Timed Mode. It has been part of two events: the Christmas Event which ran from December 19th until December 28th 2015 and had players collect presents; and the Frozen Factory event that ran from February 20th until February 29th 2016 and had players collect snowflakes. As an event stage, Frozen Factory was suitable for all three types of characters. This page was last edited on 2 March 2018, at 09:48.